Please accept this as a reference letter for Amy Kellock- Skinny Legs Roaming Chef. I hired Amy for a 50th birthday dinner celebration for my husband on March 14, 2015. 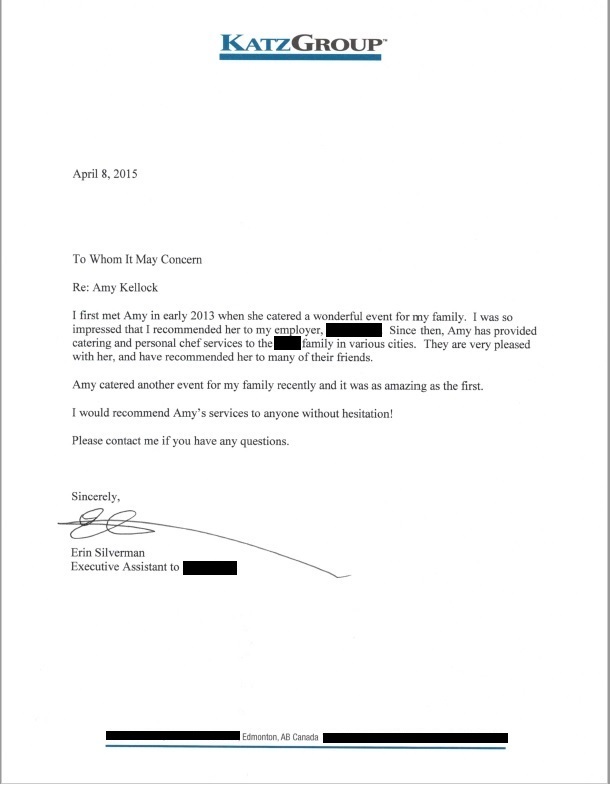 From the first time that I contacted Amy, until the completion of our dinner, I found her to be a pleasure to deal with. She has positive energy, and is very pleasant, flexible, and accommodating. Amy’s attention to detail and hard work was evident throughout the menu planning, food preparation, and execution. She took charge of everything, and I was free to be a guest at the dinner party. At the end of the evening my kitchen was immaculate, as Amy took care of kitchen cleanup in addition to everything else that she did that evening. It takes a special person to walk into a strange kitchen (site, equipment, and utensils unseen) and produce the meal that she did. The food was amazing and every course was exceptional. My husband and I were extremely pleased, as were our guests. In addition to Amy’s chef services, I chose the Prada Full-Service Package which Amy offers and arranges. This package provided a server who took care of the food and wine service for the evening. I was very happy with this service. In conclusion, I would highly recommend Amy. I would rehire her without hesitation. We had a fantastic time last night. Thank you so much for all your effort and the amazing food that you made for us. It was all so good! Such a pleasure to have you cook for us in our home. Richard says he has an electronic receipt that he can forward to you on Monday. Thank you again for all the prep and time you spent to create all 5 courses. Your food was so delicious and it was such an honour to have you cooking for us.